Nearly a year after PTC announced it would change CAD history, how does Creo 1.0 deliver? A year ago, PTC generated much speculation with ads that claimed its new software would get us all “out of CAD jail.” When unveiled, we learned of newish software and a new name: Creo, it was explained, means “create” in several Latin languages. Creo is a second restart for PTC, the company that ignited the parametric and history-based CAD design in the late 1980s. The first restart was named “Wildfire,” in which Pro/E was tuned for Windows and the Internet. When PTC renamed its CAD software “Creo,” it confused people into thinking this was new software. In the weeks that followed, PTC had to explain that Creo was only the beginning of a rewriting its old software. 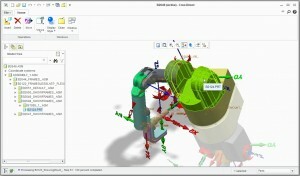 As well, the company’s direct modeling CoCreate software was renamed “Creo Elements/Direct Modeling.” This software shouldn’t be confused with “Creo Direct,” a smaller scale direct modeling package developed on the Granite kernel and purpose built by PTC to partner with Creo Parametric. When it comes time to decide on licensing Creo from PTC, you have the two same choices, Creo Parametric (i.e., Pro/E) or Creo Elements/Direct (i.e., CoCreate); everything else is a module that you call from one of these two, such as sketches, layouts and simulation. Installing Creo is much like other software, with one exception: The license server. The server software installs on your computer, and it determines whether you are allowed to run the software. Some customers experience no problems; others have problems, as I did. The server works by tying the Creo license(s) to your computer’s CPU serial number and monitoring the network card every few minutes. In my case, the serial number I received was incorrect, preventing installation. Tech support guided me through the multi-step process for applying for a new license from the PTC website. Days later, Creo balked at running when I reopened the lid of my notebook computer, waking it from sleep. Because Creo could not communicate with the license server, it asked if I wanted to save my work before it exited. Problem was, it would not let me save. Tech support advised me to use Task Manager to stop the license server service (lmadmin_ptc), and then run the ptcadminstartservice.bat file to restart it. (The batch file is in C:Program FilesFLEXnet Admin License Serverbin). Tech support and I continue to work at finding a better fix to the problem. When PTC launched Creo, their aim was to solve, “four unaddressed problems in the MCAD space: usability, interoperability, assembly management and technology lock-in.” PTC provided me with Creo Parametrics and Creo Direct for me to check out their claims. Usability: Besides a new name, the Creo line of software sports the now-common ribbon user interface and a softer blue-green color scheme. Opening either Creo Direct or Parametric brings up the new ribbon interface along the top, and a not-new integrated Web browser in the drawing area. The ribbon is meant to make it easier for new users to find commands, because, as one old-timer put it, “In Pro/E, you could find any command — in seven mouse clicks.” For power users, the old Mapkeys facility continues to work. The tabs of the integrated Web browser take you to PTC’s website, and to Catalog Data Solutions at www.3dmodelspace.com/ptc. The catalog site provides access to 3D parts and data that could be useful in mechanical drawings. However, I found that CDS is a search engine, not a component supplier like Autodesk’s Seek site, and so linked sites are not guaranteed to have 3D models available for Creo; I found it was largely hit or miss. 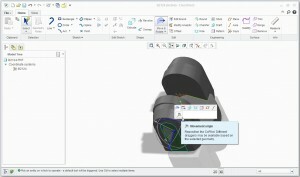 Interoperability: My plan was to begin testing interoperability by opening a non-PTC model and doing some direct editing in Creo Direct before handing to Creo Parametric. The benefit of a direct modeler is that it can work with “any” kind of imported 3D data. Competitors’ direct modelers, like Inventor Fusion and SpaceClaim, directly open a half-dozen or more brand name CAD files, like SolidWorks, Solid Edge and Pro/E. Thus I was surprised that the only “brand” name in Creo Direct’s file type list was Rhino, which is an open file format. All others are PTC formats or neutral ones, including IGES, VDA, Step, ACIS and Parasolid. PTC’s marketing department told me that SolidWorks support will be available in an upcoming update to Creo, while NX, Catia and other proprietary formats need optional add-on modules. Figure 1: Creo Direct allows users to move and delete parts of assemblies imported from other CAD systems. After I opened a Parasolid assembly in Creo Direct, the only editing operations permitted initially were moving and deleting parts of the assembly, (See figure 1). However, once I burrowed down the model tree to a part name, I could open the part for full editing in a second window, (See figure 2). After drilling down in the feature tree, Creo Direct allows parts from imported assemblies to be directly edited in a separate window. When Creo Direct opens models from other systems, it converts them to Pro/E’s own .asm and .prt formats, so that they can also be edited by Creo Parametric. However, you can import foreign models directly into Creo Parametric for more advanced editing. Technology Lock-in: PTC’s ideas on solving technology lock-in don’t match mine. To me, we should be able to move our drawings to (and from) any CAD package, keeping in mind the limitations of translation. In contrast, PTC feels the modular nature of Creo ensures the company can now deliver new CAD technology more quickly. In addition, PTC boasts of its many translators for importing models and drawings from competitors’ systems, so that you don’t need to be locked-in with them. Creo Direct exports only in IGES or STEP; Creo Parametric in several open and proprietary formats, depending on whether you’ve purchased the additional translation modules. Assembly Management: Blocks and scripts were CAD’s first steps in automating manual drafting; most recently, MCAD vendors are letting salespeople generate drawings by filling out forms in the customer’s office, and this goes beyond CAD. PTC calls this “assembly management” and offers its WindChill PLM software, saying it integrates more deeply into 3D models than any competitor product. That PTC called this an “addressed problem” during the Creo launch puzzled me, for the company had been touting its WindChill-Pro/E package long before Creo made an appearance. So, not new. To sum up, PTC promised to release users from four kinds of CAD jail with Creo. So far, it has partially hit the mark. Usability-wise, Creo is just catching up and interoperability works with optional modules; Creo Direct and Parametric are connected only by sharing the same files. For assembly management, Creo works with WindChill technology which existed before. As to technology lock-in, Creo Direct is designed to be a one-way street, while Creo Parametric imports and exports many 3D formats. All in all, Creo is an improvement over Pro/E for those users who are required by their employer to run the software, but version 1.0 feels immature compared with established products like Inventor, Solid Edge and SolidWorks. Above all, PTC needs to deploy a modern licensing service.